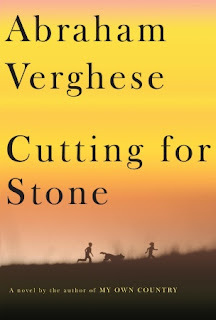 Alright, put your faces on stunned, because Cutting for Stone by Abraham Verghese is about the lives of mirror twins born of the illicit affair between a surgeon and a NUN. *shock, awe* Marion and Shiva came into the world very dramatically. Their father, Thomas Stone, didn't know their mother Sister Mary Praise was pregnant with his sons. In fact, he can't even remember doing the deed. And it's all too late to talk about because she dies in a scene of blood and gore. Thomas has a breakdown and runs away from Missing Hospital in Ethiopia leaving his sons to be cared for by two other doctors. Hema and Ghosh raise the boys like they were their own blood. The boys have a fairly happy but unusual childhood growing up in a hospital serving the poorest people. Although the twins often function as one being (ShivaMarion), they are opposites in personality. Though quiet, Shiva is a genius and doesn't quite understand relationships. Marion, who narrates the story, often doesn't get his brother. When Marion falls hard for Genet, a beautiful Ethiopian girl, he vows to have her even though she's awful to him. She does some nasty stuff to him that causes a rift between brothers and ultimately has Marion fleeing to America. In the US, Marion works hard honing his surgical skills and trying to forget his past. As fate would have it, his past will catch up with him in a couple of very BIG ways. There is a lot going for Cutting for Stone. The setting of Ethiopia is exotic, interesting and beautiful. Every character is well created, you can't help but love them (except for one or two). The story is both entertaining and engaging. I enjoyed so much of the book, but... it was a massive book. I like big books and I can not lie but I felt a lot of it could have been edited down- the medical parts especially. If you are bothered by blood, you better pass because there is a LOT. There is one aspect of the story that bothered me: the relationship between Marion and Genet. I just didn't understand why he loved her so much. Sure she was beautiful but she treated him like dirt. What she does and how he reacts to her has terrible consequences. Ugh. It was a great book, for sure, but there was something about it that just didn't float my boat the way it did for other reviewers who thought it was awesome. Great review! I enjoy hearing a dissenting voice once in awhile. A book can't be great for everyone. It does sound like the premise is a good one. Great review! You made me laugh when you said you like big books and you cannot lie!